Qatar is not diversifying its economy because it is, unlike its Gulf neighbours, running out of its oil and gas reserves any time soon. They have the third largest gas reserves in the world, following Russia and Iran, with an estimated 872 trillion cubic feet – the equivalent of 188 billion barrels of oil. At the current production rate, it is estimated these reserves will last for approximately 156 years. The country is branching out because there is more to Qatar than oil and gas. The country has embarked on a wide-ranging investment programme to enhance the economic diversity ahead of the 2022 FIFA World Cup. The programme includes investing oil and gas revenues into major infrastructure projects, industrial manufacturing and to strengthen and develop financial and government services. The diversification also includes the transportation services and the tourism sector. The investment aims to diversify national revenue sources, rebalancing Qatar’s economy to focus on knowledge sectors that is in line with Qatar’s National Vision 2030. The inaugural Qatar Self Sufficiency Exhibition 2018, which just concluded in Doha (April 1-3), was one such impactful declaration outlining the country’s expansion plan. The expo provided the perfect platform to showcase latest production lines for food, healthcare, industrial and environmental sectors. Apart from local manufacturers, the trade fair caught the fancy of exhibitors from Kuwait, Lebanon, UK, Turkey, Spain, USA, France, Italy, Germany, Switzerland, Iran, China and more, who congregated at the Doha Exhibition and Convention Centre to network and share ideas for growth and development. Deals worth QR 15 Million were signed. Abdulrahman Saleh Al Obaidly, Chairman of HiSky for Tourism and Exhibitions, the organisers of the exhibition, said that the idea stems from the vision of the Emir to broaden the economic horizons and focus on the significance of self-sufficiency. It is expected that post 2022, Qatar will maintain a new chapter of economic progress focused on knowledge sectors and developing international expertise and talent. Embargo a boon in disguise? It’s been nearly a year since the Saudi Arabia-led blockade came into effect. If the idea was to stifle Qatar’s progressive stride, it has failed miserably. What it has done instead is it has stimulated the tiny nation into becoming more resolute and self-reliant. It triggered the emergence of a new Qatar. While it was tough going initially, the siege finally drove Qatar to focus on turning hardships into privilege and freedom. There has been an explosion of developmental activities in all sectors of the economy. It is rapidly achieving food security with new-fangled urgency after the blockading countries severed supply routes. The predicament inspired Qatari farm owners to expand farmlands and amplify food and fodder productions with government support. Thousands of Jersey cows have been flown down from Australia to boost milk production and make Qatar self-reliant in dairy products. As per a ministry report, Qatar’s poultry sector has seen a production surge from 40 to 80 percent since blockade took effect. It is also becoming self-sufficient in fresh meat by producing 100 percent of its requirements by 2018 end. The country has doubled its livestock and increasing fish yield with the start of fishing projects in its territorial waters. Qatar has been continuously intensifying and deepening its trade relationship with a number of friendly nations. Metro and light railway networks and FIFA World Cup-related ventures are progressing advancing unimpeded. Qatar’s economy is predicted to remain one of the fastest growing in the region with a projected 3.4 growth in 2018. Given the limited local population and the workforce in Qatar, the additional employment opportunities generated during the process of economic diversification will benefit locals as well as expatriates from around the world. There was a reported decrease in job advertisements in Qatar at an average rate of 20% per month in the initial phase due to the blockade. However, the changing dynamics and the growing thrust on economic diversification through the setting up of new industries with the injection of foreign investments promises a robust market for people looking to make a living in the world’s richest country. Although the Qatar government is already involved in reforming the labour laws, it must now also consider making it favourable enough to attract employees from various nationalities to fulfil its future workforce demands that is expected to continue to rise. Qatar’s government has rolled out new requirements to prove one’s higher education credentials. The move appears to be an effort to curb fraud, but has also made it difficult for qualified grads to find work or change jobs in the country. Graduates of foreign universities are now required to obtain a letter from their institutions confirming specific details about their courses before receiving approval for a residence permit. Additionally, Qatar will no longer allow companies here to hire grads who have studied for all or part of their degrees online, new government guidelines reveal. The stipulations are in addition to existing rules that require expats to have degrees and transcripts attested by their own government and the Qatar embassy in their home country. Speaking to Doha News this week, many people said they have been struggling with the process since it was implemented in June. Some are clients of Venture Partner Qatar, a company that helps investors set up businesses here. The firm’s General Manager Dale Ashford told Doha News that the government began rejecting job applicants’ degree certificates when the new rules took effect a few months ago. There was no grace period after the government issued a circular on June 1, he added. Additional information can be found here, courtesy of the Philippines Embassy in Doha. “There are many questions concerning the ‘statement’ on behalf of the University/Institution, not least, who will prepare it. This is something entirely new for them and will entail a considerable amount of work. Presumably, some form of charge will have to be levied for this. 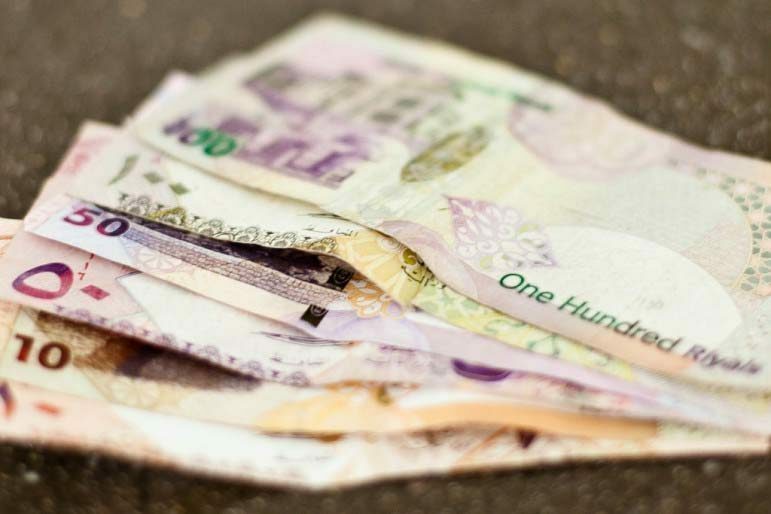 Expats already in Qatar would most likely have to pay agencies to help them complete the attestation process in their home countries “at quite a cost,” he added. Additionally, he said the new ban on distance learning degrees will cause significant problems for many job applicants, particularly Master’s students, who often study online. Because the new regulations were introduced without warning or publicity, they have caught many by surprise. Melissa Paterson Hernandez, an American expat who works in higher education in Qatar, said the changes have made it even more difficult for her husband to find work here. Also an American citizen who works in education, he currently lives and works in Abu Dhabi. The couple fly regularly between the two countries to try to co-parent their four-year-old daughter. “He took some online courses in his MBA degree in the USA, so it will not be accepted (under the new rules). Now we are trying to get his undergraduate degree in Mexico attested,” she said. The couple have so far paid around US$2,000 to try to complete the attestation process, but must now go back to the drawing board due to the new requirements. Even if they manage to assemble all of the documents and get the necessary approvals, Hernandez said she is uncertain that Qatari authorities will accept documents stamped by a UAE Embassy. “I am not sure if it is even worth it. We were trying to have his degree ready for when he did find a job he could just bring the paperwork with him. 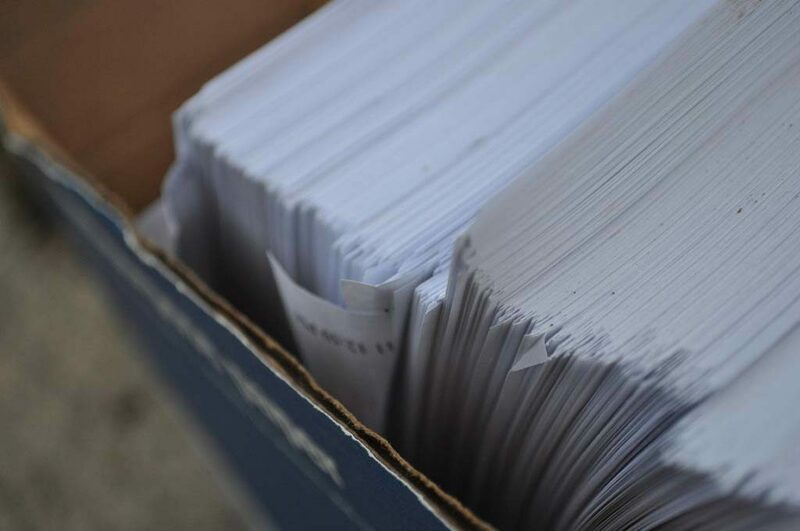 While the new regulations may seem unnecessarily onerous, they are being introduced in response to an apparent proliferation of fake degree certificates in Qatar. To combat the problem, Al Jaber suggested that fraudulent engineers, doctors and accountants be publicly named and shamed. Qatari authorities take this kind of fraud very seriously. Last year, an Indian expat was sentenced to three years in jail for faking a degree to help him get a promotion at work. Qatar has the highest percentage of women in the workforce out of all the Gulf states, according to a new survey. A total of 51 percent of women in Qatar over the age of 15 years old were found to be working, compared to less than 30 percent in Saudi Arabia and Oman, the study Power Women in Arabia: Shaping the Path for Regional Gender Parity found. 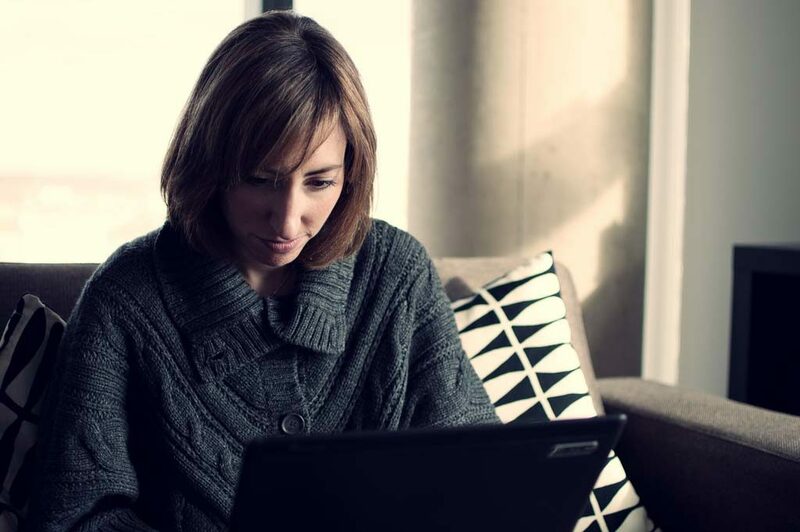 Compiled by management consultants AT Kearney and B20 Employment Taskforce, the report looked at trends and figures for women in education and employment, and the opportunities for female entrepreneurs in the region. The survey found that across the GCC, there are more women in work and education now than two decades ago. Additionally, opportunities for businesswomen are improving, although at a slower rate than in other parts of the world. In the 20 years from 1993 to 2013, the report found that the number of women working in Qatar has risen by 19 percent. However, the growth is slower than in other GCC countries such as the UAE, which saw a 63 percent rise in women’s participation in the workforce over the same period. “A.T. Kearney’s study confirms the great progress achieved so far in the Gulf Cooperation Council (GCC) regarding gender equality in the workplace. However, there is still much to be done. When looking at women in leadership positions, we still face an enormous gap vis-à-vis other parts of the world. Qatar’s female workforce numbers are likely enhanced by the large percentage of expats living here. While the AT Kearney report doesn’t give a breakdown of nationals and non-nationals, figures from the Qatari government have found nearly two-thirds (64 percent) of expat women work, compared to just over one third (36 percent) of Qatari women. This is according to the latest figures, from the second quarter of 2015, provided by the Ministry of Development, Planning and Statistics in its regular Labor Force Survey. Still, an increasing number of women in the region want to have a career – 31 percent said they were interested in working or needed to work and 27 percent said they wanted to improve their skills and capabilities. Qatar also has the highest percentage of women (88 percent) pursuing higher education in the Gulf. 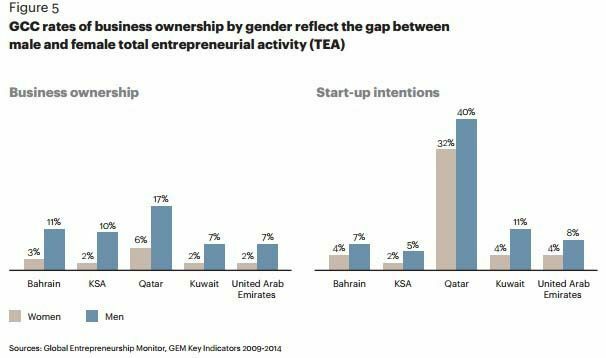 However, the report also found that startups in Qatar remain male-dominated. Around one in six men in Qatar currently own their own business, while just 6 percent of women do. However, many residents voiced entrepreneurial aspirations, with some 40 percent of men and 32 percent of women saying they wanted to start their own company – way ahead of those in any of the other Gulf states. For example, in Kuwait only 11 percent of men and 4 percent of women said they’d be interested, while in the UAE it was 8 percent of men and 4 percent of women who did so. The report’s authors call on policy makers to improve the framework for women by putting in place supportive systems such as suitable maternity leave and state child care as they exist in Nordic countries. It also suggested private companies consider adopting more flexible working hours and ensuring they have strong role models in the organization. And it said individuals should challenge the culture and mindset of those at work and at home to enable greater progress. Meanwhile, Qatar is the best destination internationally for working women who want to boost their salary and those who want to save money, according to a separate global survey. The HSBC Expat Insider Survey 2015 found that 57 percent of the 10,000 women from 25 countries who took part said that Qatar was the best place to work in order to earn more than in their home country. Meanwhile, nearly three-quarters (73 percent) of the women surveyed picked Qatar as being the best place to put away more of their income than the would be able to back home, the report authors said in a statement this week. Hong Kong came out overall as the best place for women to advance their career (63 percent ), followed by China (59 percent) then Singapore (56 percent).